Since Ra God, in his various forms and unions with other gods, was the sun god and father of the Great Ennead, his adventures affected the entire universe. His power and brilliance were great, his actions affected other gods and mortals alike. He had created the world and the gods and people who populated it, and he maintained his position of eminence as father of the gods even after others gained equal or greater power. As sun god, his chief function was to travel the skies daily and provide light and heat for the residents of earth; as chief god he was sometimes involved with other gods in events that were closely watched by all who might be influenced. through untold spaces [requiring] millions and hundreds of thousands of years [to pass over]; you pass through them in peace, and you steer your way through the watery abyss to the place you love; this you do in one little moment of time, and then you sink down and make an end of the hours. Actually there were two boats: Matet (which means “becoming stronger”) for the morning, and Semket (which means “becoming weak”) for the evening. Khepri, Ra God, and Atum, the various forms of the sun god during this journey, sat in the middle of the boat while Horus was the steersman at the rudder. Thoth, the god of wisdom, and Maat, the goddess of truth and justice, wrote down the daily course for the boat and then stood beside Horus to approve the course he set. Abtu and Ant were mythological fish that led the boats through the expanses of ocean. The king at his death joined the crew as Ra’s immortal secretary. The king rode in the bow of the ship, where he opened Ra’s boxes, broke open the sealed edicts, sealed his dispatches, sent out his messages, and generally did what Ra God asked of him. He was also responsible for watching over Ra’s jar of cold water during the day. The goddess Nehebka rode in the Matet boat; since she was goddess of “matter revivified,” her presence caused considerable rejoicing among the dead souls who accompanied the ships during their voyages. The boat settled into Manu, the mountains of the sunset, where as the evening boat it entered the waters of the underworld, called Tuat. 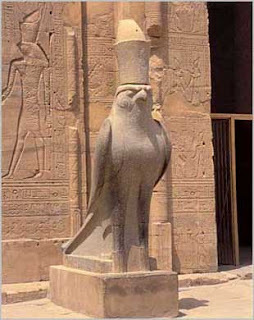 As the sun set Horus, Hapi, Isis, and Nephthys were seen in adoration. As if the nightly journey out of sight were not difficult enough, the boat was attacked during the night by its enemies. Although Ra God carried with him a company of strong, wise, and fair gods, of whom he was the strongest, his enemies never hesitated to try to find a weakness and destroy him. Collectively the enemies were Sebau, a legion of devils, but the most dangerous was Apophis (variant spelling, Apepi) who took the form of a serpent. His attack on the sun god was seen as an attack on the stability of the world, and therefore his defeat was essential. Originally, Apophis had been viewed as the darkness that surrounded Nun, and the first serious obstacle to the creation that Ra God had to overcome. Later, however, Apophis personified the darkest part of the night that Ra God must defeat before he could rise again in the morning. He attacked with mists, eclipses, and other phenomena that hid the light of the sun or moon. Ra God counterattacked with the darts of his sunbeams and sent his scorpions to sting the snake, but at the moment of greatest danger he left the boat and took the shape of a cat, an animal admired for its agility. In this form he cut off the head of the serpent. The nightly fate of Apophis was ghastly: he was bound in chains, then stabbed with spears, cut and dismembered with red-hot knives, and finally roasted and consumed by fire. Apophis was crafty and had many names to confuse Ra God and his assistants, but the papyri listed them all so that the dead souls could help Ra God to identify his enemy by the use of magic. The pink glow in the sky at evening was attributed to the blood that flowed from the wounded and defeated Apophis. In the morning Ra God arose again safe from the battles of the night, glorying in his victories over the powers of darkness. His brilliance undiminished, he sailed through the heavens on another of his daily voyages. His renewed presence gave new I hope to those who depended on his light and warmth and was | the cause of much rejoicing.